I'd give you one with my name next to it to show that I didn't just grab someone's picture, but the mask is currently on my shelf in a different town. How rare would you say the dark gold Kraahkan is? The one from that old Visorak playset? Heh, that is a odd one. seeing as that was not a rare set, but it is pretty old...so heck, I dunno. Not rare, but valuable since it came in a common $50 set with mostly common parts. If you were a bricklink seller I suspect that this would be your main profit-maker in 8758 alongside the kiril doorway and the bohrok head plate. 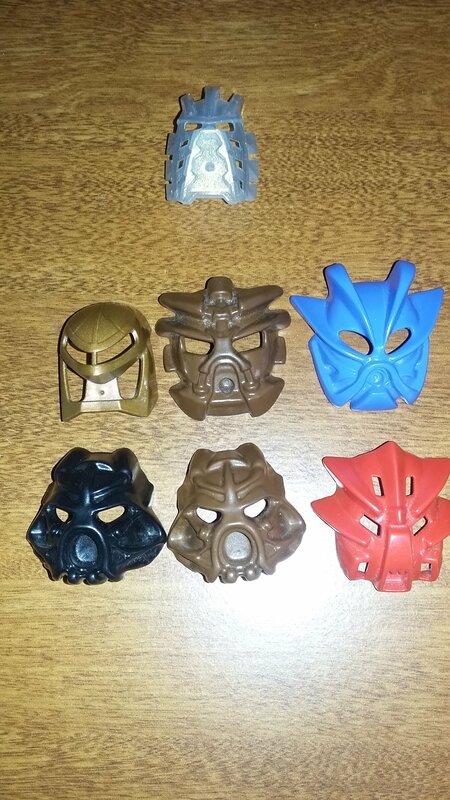 Chrome Hau, some silver Nuva masks, orange and gold masks of time, movie and ultimate Dume Makuta masks, glittery mask of Light, infected Hau Nuva, translucent neon green Miru, gold Ignika, gold skull mask. I probably forgot some 2001-2003 masks though. I don't know if it counts but I also have every Krana (minus two) and the disk of time. I have seen the Krill doorway for a dollar on Bricklink...dunno if that is good or bad. Yeah, I haven't collected masks nearly as much as I'd like. (I hope to collect masks every mask after I collect every set. Either the Gold Vahi, Trans. Neon Orange Mask of Fire, or the Gold Skull Mask. And a misprinted Matatau in white! Here are my masks not released in normal sets, and a glittery Avohkii, 'cause why not. These all belonged to my friends' brother back in the day. He outgrew BIONICLE and passed them down to my friend, who outgrew BIONICLE and gave them to me, so they've been on quite the journey. Are any of them especially rare? I don't really collect masks, and I don't know their values.